News and views on Warmaster from the iFelix Blog. Warmaster is a set of mass fantasy battle rules from Games Workshop. Unlike Warhammer which used 28mm models, Warmaster uses 10mm high figures. 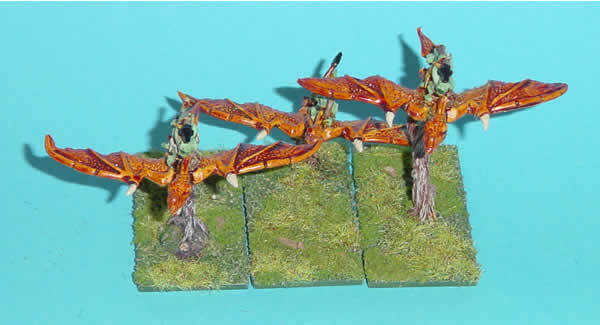 I have added some pictures from a Warmaster game at GamesDay 2007. I have added some pictures of the new Warmaster Araby miniatures. More pictures can be seen on my GamesDay 2006 Show Report pages. You can now advance order GW's 10mm Battle of the Five Armies game. This boxed game contains everything you need to get started with the The Battle of Five Armies game system. A full colour 96 page Rules Manual, 9 characters & Beorn, 24 stands of Goblin infantry, 12 stands of Goblin Wolf Riders, 12 stands of Wargs, 3 stands of Men with bows, 3 stands of Men with spears, 6 stands of Dwarves, 6 stands of Elves with spears, 6 stands of Elves with bows, 3 stands of Eagles, 2 plastic hill sections, plastic ruins, card river sections and assorted dice & templates. It will cost £50 which is about what you would expect from GW. One question though is this Warmaster? It uses the Warmaster system, but it is a Lord of the Rings version. We have added some photographs taken at GamesDay 2004 which includes some shots from a Warmaster game and pictures of the Battle of the Five Armies scenery and armies. We have added some new photographs of a Warmaster battle from Bristol Conflict 2004. 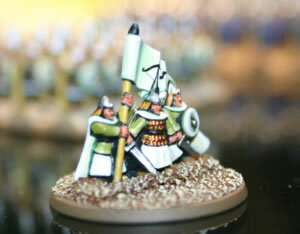 We have added some new photographs of a Warmaster battle from GamesDay 2003, alas they are a bit fuzzy. We have added some new photographs of Warmaster miniatures as well as reorganising the original pictures of the Empire miniatures and Scenery. Check out the new Galleries page. Warmaster® are a set of mass fantasy battle rules from Games Workshop. Unlike Warhammer® which used 28mm models, Warmaster uses 10mm high figures. Dwarfs: containing information on new and wonderful war machines and siege cannons, complete with photographs of work in progress. Orcs and Goblins: starting with snotlings, though now with rules for Boar Chariot units, and Wolf Chariot mounts for your Goblin hero. The Undead: where are the zombies? The Empire: the peasants are revolting... and introducing the Hibblesvanian Swine! Now with pictures. Grunts: Warmaster and the M16!!! Scenery: a little house here and little wood there, includes pictures. Battle Reports: some pictures of some battles (well one at the moment).